Part Number: 96525. Compatible with up to 16X DVD-R Hardware. Read compatible with most DVD-ROM drives and DVD video players. Part Number: 96526. Compatible with most 16X DVD R drives available. Read compatible with most DVD-ROM drives and DVD video players. White Inkjet Hub Printable Top Surface. Type: DVD R DL. Compatible with DVD R DL drives from leading manufacturers - playback compatible with standard DVD players. Create full color high quality labels using your inkjet disc printer. Part Number: 98493. 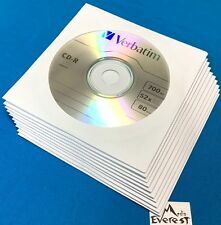 100pk VERBATIM 52X Blank CD-R CDR 700MB 80Min White Inkjet Hub Printable. Compatible with CD drives up to 52X speed. Create full-color, high quality labels using your inkjet disc printer. Part Number: 94587. Capacity: 700MB 80min. Speed: 52X. Provides digital performance, in a retro disc design - inspired by 45-rpm record. Digital Vinyl Surface. Capacity: 700MB 80min. Speed: 52X. Logo Top Surface. Type: CD-R. Product Number: 98493. Compatible with CD drives up to 52X speed. Create full-color, high quality labels using your inkjet disc printer. 700MB/80 minute storage capacity. Type: DVD RW. Utilizes Super Eutectic Recording Layer (SERL) recording dye, which minimizes noise during write/rewrite cycles and provides superior archival stability. 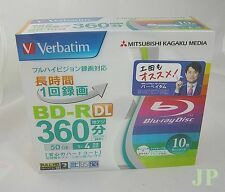 Read and compatible with most DVD-ROM drives and DVD video players. Part Number: 97177. 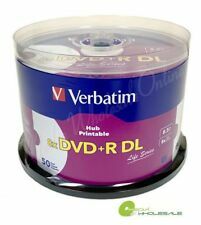 Read compatible with most DVD-ROM drives and DVD Players. 1X-16X DVD recording speed. Ideal for capturing life's events. Part Number: 96524. Capacity: 700MB. Speed: 52X. Record a CD in less than 2 minutes using a 52X CD drive. 80 minutes of CD-quality audio. Logo Top Surface. Type: CD-R. Quantity: 100 pieces. Part Number: 95101. AZO recording dye optimizes read/write performance. 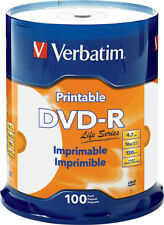 Read compatible with most DVD-ROM drives and DVD video players. 1X-16X DVD recording speed. Part # 98491. Up to 16X Write Speed. Create full-color, high quality labels using your inkjet disc printer. Read Compatible With Most DVD-ROM Drives And DVD Players. Trending at $24.50eBay determines this price through a machine learned model of the product's sale prices within the last 90 days. 1X-16X DVD recording speed. Logo top Surface. Quantity: 50 pieces. 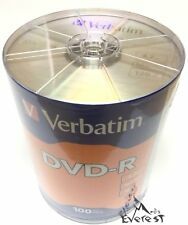 Type: DVD-R.
Part Number: 97175. 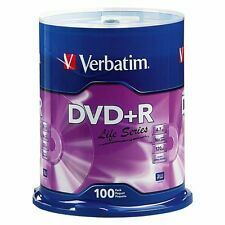 100 VERBATIM 16X Blank DVD R. Max Speed: 16X. Compatible with most 16X DVD R drives available. Logo 4.7GB Disc Spindle. Excelent recording quality, compatible with higher-speed burners. 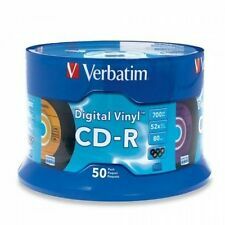 50 Verbatim 700 MB 52X Digital Vinyl CD-R - 50-Disc Spindle 94587 Multi Color Seal. Part Number: 98491. Create full-color, high quality labels using your inkjet disc printer. 1X-16X DVD recording speed. 64GB Verbatim Store 'n' Go USB2.0 Flash Drive has a retractable sliding mechanism which protects the USB connection when it is not in use. Simple and easy to use, just slide open the cap, plug into any USB 2.0 port and drag and drop your folders and files. AZO recording dye optimizes read/write performance. 1X-16X DVD recording speed. Superior ink absorption on high-resolution 5,760 DPI printers. Quantity: 50 pieces. Type: DVD-R. Speed: 1X - 16X. 1X-16X DVD recording speed. Original Plastic Wrap By Manufacture Like In The Picture(No spindle). Part Number: 98172. Original Spindle Seal By Manufacture. Type: BDXL. Compatible with BDXL optical drives. 100GB storage capacity -allowing you to use fewer discs while archiving your files. Up to 4X recording speed. Quantity: 1 disc. Space and Capacity: 700MB, 80Mins. Speed: 52X Max. 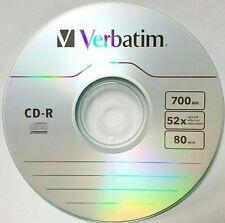 Verbatim Logo Top CD-R Disc. Manufacturer: Verbatim. Quantity: 100 Pieces. We reserve the right to correct any typos. These are XGD2 compatible & Non XGD3 Compatible. Part Number: 97693. 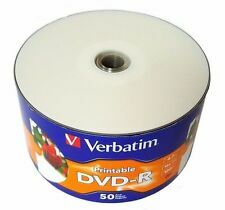 50 Verbatim DVD R DL 8.5GB 8X Inkjet Hub Printable. Type: DVD R DL. White Inkjet Hub Printable Top Surface. Compatible with DVD R DL drives from leading manufacturers - playback compatible with standard DVD players. 32GB Verbatim PinStripe USB2.0 Flash Drive features read speeds up to 10 MB/s and write speeds up to 4 MB/s. In addition, it has a push and pull sliding feature that protects the USB connection when it is not in use. Part Number: 97174. Max Speed: 16X. Excellent recording quality, compatible with higher-speed burners. 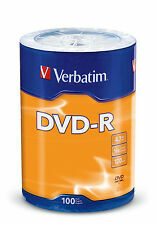 Type: DVD R. Compatible with most DVD-ROM drives and DVD Players. Burn content on discs and create customized labels Up to 8x recording speed. Records up to 8.5GB of data or 4 hours of video. Features a blank surface for full-color, high quality labels. Compatible with inkjet disc printers and DVD-R DL drives from leading manufacturers. Playback compatible with standard DVD players. AZO™ Technology For Superior Performance And Reliability. Up to 16X Write Speed. Seal Spindle By Manufacture Specifications. Read Compatible With Most DVD-ROM Drives And DVD Players. 4.7GB/120 Minute Storage Capacity. Capacity: 700MB 80min. Speed: 52X. Logo Top Surface. Quantity: 50 pieces. Type: CD-R.
1X-16X DVD recording speed. Logo top Surface. Type: DVD-R. 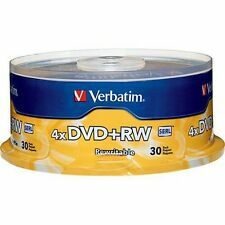 Quantity: 100 discs (2 x 50pk). Capacity: 700MB 80min. Speed: 52X. Logo Top Surface. Type: CD-R. Quantity: 100 discs (2 x 50pk). 25 VERBATIM CD-R CDR 700MB 52X Digital Vinyl Surface 80min in White Sleeves. Capacity: 700MB 80min. Speed: 52X. Provides digital performance, in a retro disc design - inspired by 45-rpm record. Digital Vinyl Surface. Part Number: # 96524. Capacity: 700MB. Speed: 52X. Record a CD in less than 2 minutes using a 52X CD drive. 80 minutes of CD-quality audio. Logo Top Surface. Part Number: 95256. Compatible with CD drives up to 52X speed. Create high quality labels using your inkjet disc printer. Part Number: 94834. Type: DVD RW. Utilizes Super Eutectic Recording Layer (SERL) recording dye, which minimizes noise during write/rewrite cycles and provides superior archival stability. Seal Spindle By Manufacture. 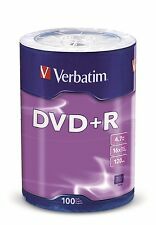 Largest compatible DVD back-up and data archiving format for computer drives. Quantity: 50 pieces. Designed for the most discerning of USB drive users, the Verbatim Metal Executive is the ultimate in sleek sophistication. Trending at $16.66eBay determines this price through a machine learned model of the product's sale prices within the last 90 days. Parts are new, unused, and ready to use in most applications. 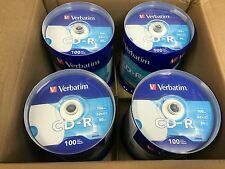 100 high-grade non-rewritable CD-R discs with one hundred year archival life. 700MB is ideal for storing digital images, music (including mp3s), video and more. Blazing drive speeds allow for 80 min files to record in less than 2 minutes. Part Number: 95098. AZO recording dye optimizes read/write performance. Max Speed: 16X. Compatible with most 16X DVD R drives available. Original Seal Spindle By Manufacture. Type: DVD R. Write Once Disc. 700MB is ideal for storing digital images, music (including mp3s), video and more. 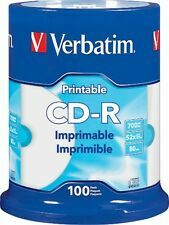 100 high-grade non-rewritable CD-R discs with one hundred year archival life. Blazing drive speeds allow for 80 min files to record in less than 2 minutes. Speed: 1X - 16X. Top Surface: White Inkjet Hub Printable. Superior ink absorption on high-resolution 5,760 DPI printers. 1X-16X DVD recording speed.